So now that its getting hot in England, I thought i would do a lil post on some of the best sunscreens I would recommend specifically for your face. I personally have very sensitive skin, so always find the body sunscreens are too harsh to use on my face so i always end up with the problem of finding a sunscreen, that will actually suit the sensitive skin on my face. although a little pricey at £18, however it does last long since your only using it on the face and neck. 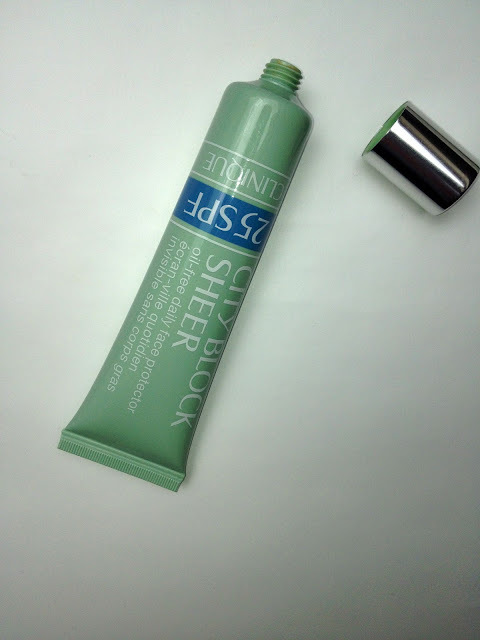 The City Block Sheer by Clinique boasts an SPF 25, and is oil free and contains No chemical based sunscreens, which is especially great for sensitive skin. It has a high level broad spectrum and contains a UVA/UVB protection which is something you need to look for when purchasing any sunscreen. It has a light weight but yet moisturising formula so another great thing is you don't have to use a separate moisturiser with this one, so your skin won't feel greasy and clogged in this severe heat! Its an ideal base to wear under makeup since it so lightweight. If I were to recommend you buy any sunscreen for your face it would be this one! The next one is The Vitamin C Daily moisturiser SPF 30 by the body shop. This one is actually a moisturiser and sunscreen in one. 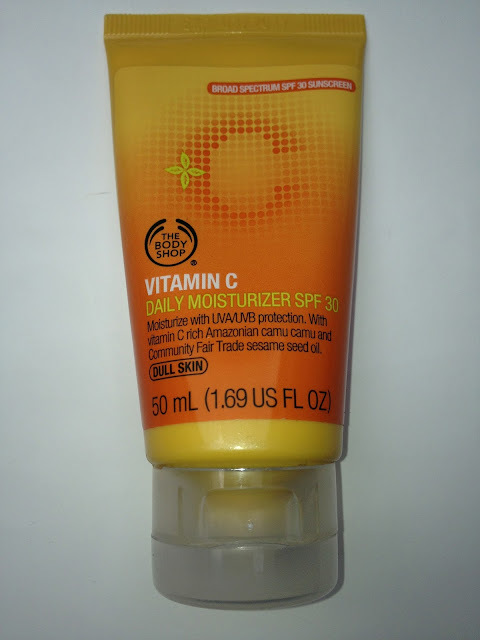 It contains Vitamin C, which is what sold me on this one since I am a big fan of anything vitamin C.
It is designed for dull skin, and helps to give your skin a clear glowing complexion. It contains sesame seed oil, so I am not sure if this would be suitable for oily skin, I think it would be better suited to normal/dry skin. Also boasts UVA/UVB an this one was around £10, so pretty reasonable and lasts a while. 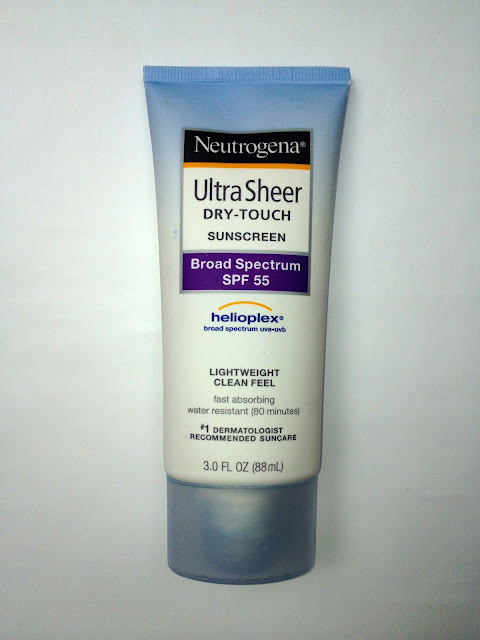 And the last but certainly not least, is the ultra sheer Dry-touch SPF 55 from Neutragena. It has a broad spectrum and contains Helicoplex which protects your skin from skin cancer and ageing. however the best part about this one is that it is a dry touch sunscreen, you know how most sunscreens feel greasy and heavy when applied to the skin, and seem to take forever to dry? well this one feels refreshing when applied to the skin and sinks in straight away, and almost feels like a makeup primer. Which by the way it does act as a great makeup primer, its suitable for all skin types, however I feel it would benefit oily skin the most since it gives a nice matte finish, and I would also recommend to anyone who likes to wear a lot of makeup since it drys so quickly and again acts as a great primer. This all around has so many benefits with one being the great price which was around £10.49 on Amazon for a large 88ml! Wear sunglasses they also help protect your skin and eyes from the sun and look cute! Keep your sunscreen in the fridge not only does it feel super refreshing when applied to the skin, but it helps keep the active ingredients preserved! let me know if you've tried any of these sunscreens, and whats you fave sunscreen? More posts to come I update weekly! i really need to get myself a good spf for my face. the body shop one sounds great.